Oh, thank god. I was going a bit crazy waiting for the dark stuff. This is quite upsetting but beautifully rendered. I absolutely love it. Wow. Very powerful and unsettling. Gave me chills. So awesome. Love those dynamic fabric folds and how pretty Tom is. Oh, and the dark subject matter is fabulous. 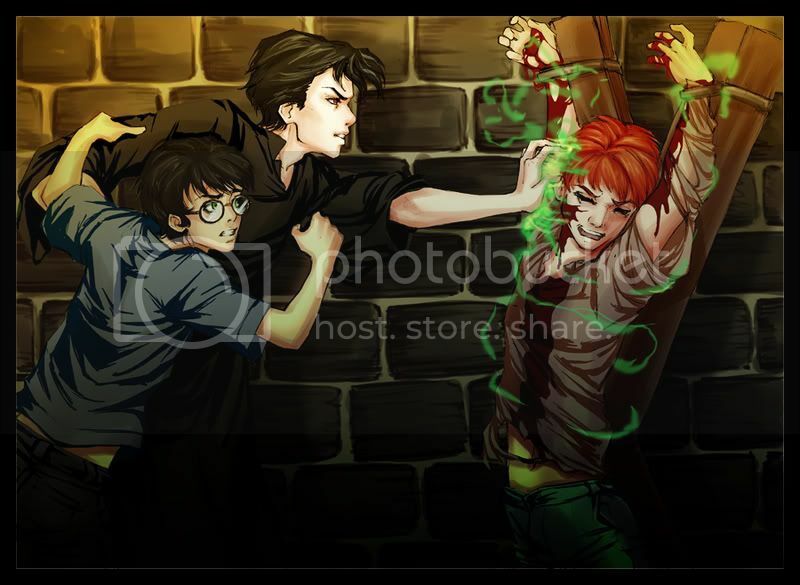 I love Ron's expression, the pain and agony is perfect. I'm intrigued by the Voldemort/Harry dynamic as it seems like there is some form of relationship between the two of them. Wow, while the subject matter is absolutely horrifying, I have to agree that the artwork is stunning. Harry's face is a picture of heartache, but Ron's agony is palpable. Oh, and Harry's eyes are gorgeous. Oh, my GOD, I love your artwork. I'm not sure I had discovered it before this! *friends you* I love Harry struggling with Riddle, and the dreadful curse spiralling over Ron, and Riddle's face, and they way we don't quite know what's going through Harry's head; is he doing all he can to prevent Riddle, or is he hearing Riddle say, "Sacrifices must be made, Harry,"?